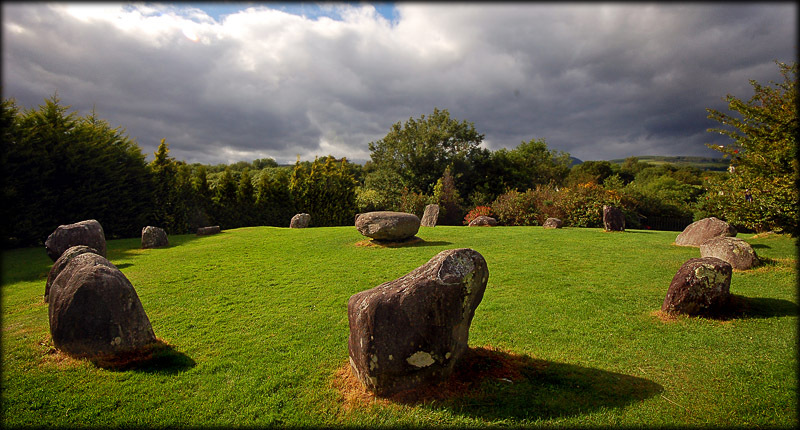 The stone circle at Kenmare has to be one of the easiest monuments to visit. It is located just a five minute walk from the centre of Kenmare Town. The down side is, the monument and it's surroundings are so well tended it looks more like a garden feature than a Prehistoric monument. There are pine trees completely encircling it and the grass is kept very short almost lawn like. All this is reflected in the name it is known by locally "The Shrubberies". A little too pristine for my liking. The ellipse shaped circle measures about 17.5 metres at the widest point and 15 metres at the narrowest point. It consists of fourteen low boulders and a one metre tall slab like stone. In the centre of the circle is a very impressive boulder burial. 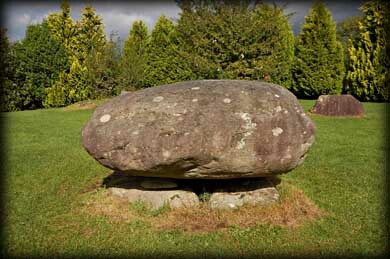 The 1.5 metre wide boulder is resting on at least three other low stones. 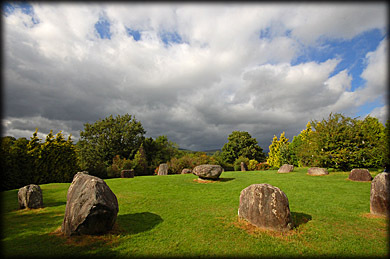 It is similar to the stone circle at near by Dromagorteen, it too a boulder burial in the centre. 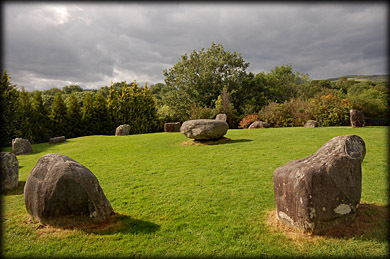 It is thought to be the largest circle in south west of Ireland. Originally there were splendid views of Kenmare Bay and the surrounding mountains but these have now been blocked by the fir trees. The landowners are asking for a donation of two euros towards the up keep of the grounds. Situated: Very easy, at Cromwell bridge in Kenmare town turn left by the tourist office. When the road bends left go right through the gate down short road. Discovery Map 78: V 9069 7083. Last visit July 2011.